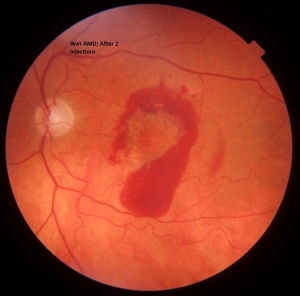 Wet macular degeneration is a condition where abnormal blood vessels grow through the layers of the retina and cause damage to the retinal layers and cells . The final result of this damage is scaring in the center of the retina causing central visual loss. There is usually no pain in the eye when macular degeneration happens. Most of the time, the treatments cannot reverse the damage to the eye. In most cases, measures can be taken to reduce the eventual damage (damage limitation). These decisions can be complex and depend upon the type of macular degeneration. A new treatment for patients with macular degeneration has emerged. This is called iol AMD eyemax mono and is an extended macular lens for patients with dry AMD and other AMD forms and diabetic maculopathy. This is an alternative to a standard monofocal lens that can be implanted during cataract surgery. The eyemax mono optic provides high quality images upto 10 degrees of eccentricity from fovea deflecting the rays of light to the healthier parts of retina. This depends on how much central retina is diseased. This is currently a new lens and is used by a select few surgeons. The advantage in having this lens is removal of the cataract as well as magnification of the image. The disadvantage of this lens is a slightly bigger incision, need for spectacles for near , distance and intermediate vision and difference in image sizes if the other eye needs cataract surgery or has had cataract surgery with a standard lens. This is an expensive lens that is inserted in the eye at the time of cataract surgery. If you are interested , please ask for literature and this can be sent to you by post. The patient usually undergoes tests which include a colour photograph of the retina, a dye test and a scan of the retina. 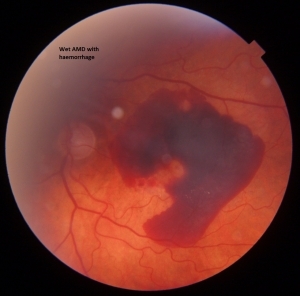 If there are signs of wet macular degeneration that are expected to benefit from treatment, then the patient undergoes 3 injections of antiVEGF treatment (one injection each month for 3 months). The patient then enters an observation period and will then be offered treatment only if it is required.